I met Fabrice at the top of the hill in the lovely forest at Whangateau in New Zealand, a scenic spot in the middle of the North Island. Fabrice was kind and smiling as usual, with an honest desire to talk about his project and share pure wisdom on natural building and carpentry. He has traveled extensively and has been working as a baker all his life. ‘Bread baking is a magic craft’, he said with a charismatic voice. He is right. The making of bread held immense cultural value in the past and still evokes suggestive poetry in its vibrant social significance. The meaning of bread raises fascinating questions as to the relationship between a cultural icon and the producers of this icon. The French baker seems to know exactly the uniqueness of this art. "The core of this project is social cohesion; a community oven can actually bind people together and intensify relationships through intellectual nourishment and communal living", Fabrice pointed out. The project started almost two years ago, with several breaks during the process, because of a lack of laborers and volunteers at the farm. On average it takes about six months to build the foundations of such an oven, including the walls, taking into account temperature, humidity and availability of material in the area. "We were lucky because we decided to build the oven in the right place. After a few attempts, we found the red clay, the magic clay, just here at the top of the hill, seventy meters above sea level. Digging deeper, we found more of the precious material, so we built the exterior walls". 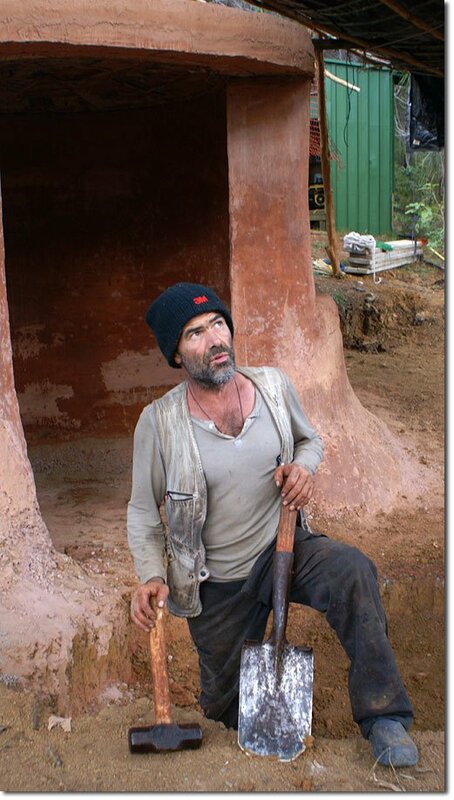 The mixture of red clay, scoria (red volcanic rock), lime, pampas grass and water is Fabrice’s secret recipe. The high content of calcium in lime replaces the cement when this calcium burns out under heat: this was the original and ancient recipe for all ovens. 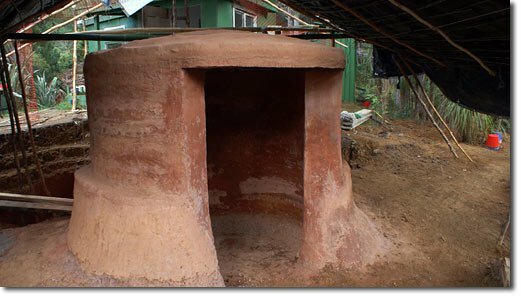 In fact old ovens were built using only fire clay with lime and no cement. "Depending on the quality of the clay, it is possible to choose the other ingredients and hopefully create a sophisticated mortar with only locally available materials", he said. During breaks in the interview, we both appreciated the consistency of the clay and the different layers naturally designed in the surrounding soil. He deliberately separated these layers into red and yellow clay, the latter more likely to be used for pottery. "We collected the red clay for the walls and we added ten percent concrete for the foundations, since building a good, strong and well-insulated base is essential. In order to model the clay we built a fire inside and then we worked on it, creating a huge dome out of clay, containing the three layers of different sized ovens in it", he explained by waving his hands in the air and drawing invisible objects. This is an unconventional oven, I admit. They dug and recovered a great amount of the refractory mortar. They then created the hole to allow the clay to fire at a slowly increasing temperature to at least 1000° C. They provided support for the side walls by pouring cladding behind them and added the roof after, by filling up the interior with sand to avoid any collapse of the structure. "This is a triple oven: the first oven would be the children’s oven and it would be at the lowest position (approximately 50cm above ground level). Above that is the family oven suitable for adults (approximately 130cm from ground level). On top of both is the professional oven, specifically made for large quantities of bread and pizza. This latter oven would include a large opening from the rear. Obviously, the triple oven is designed for anyone in the community, from children to adults, willing to experience and learn the art of bakery". Several cavities and chimneys would be placed at strategic points and an external, subsidiary wall would surround the existing oven to form a wind break and protect the area. The Whangateau Community Oven is a stunning experiment based at ‘Caretaker Farm’ run by the clever and caring Professor Audrey Sharp and it has been constructed by around 35 WWOOFers and helpers from all over the world. The triple oven will be working in a few months, available to all the people in the neighbourhood and especially to the children and young people attending the Educational Centre currently awaiting construction approval. "Finally, it will be a meeting point for everyone in the area, a space to be maintained by local people and a special gathering place for learning, creating and communicating", Fabrice joyously announced. 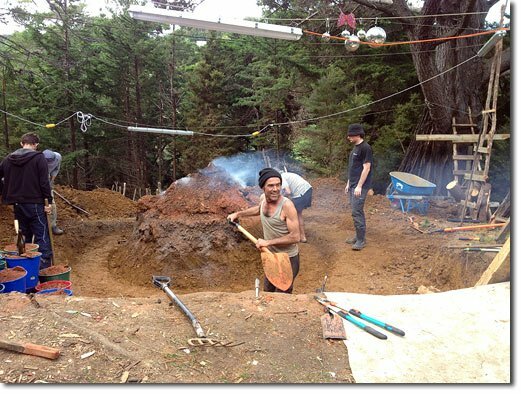 The Whangateau Community Earth Ovens Project is a project for the local and international community to learn about sustainable methods of cooking, making pottery and the construction of earth ovens using sustainable and recyclable materials. This project is based at Caretaker Farm in Whangateau, North Auckland. Caretaker Farm is a property owned by the family of Audrey Sharp who originally purchased the farm in December 1988. The Whangateau Community Earth Ovens Project is a charitable trust set up to support a community arts and cultural education centre based at Caretaker Farm.